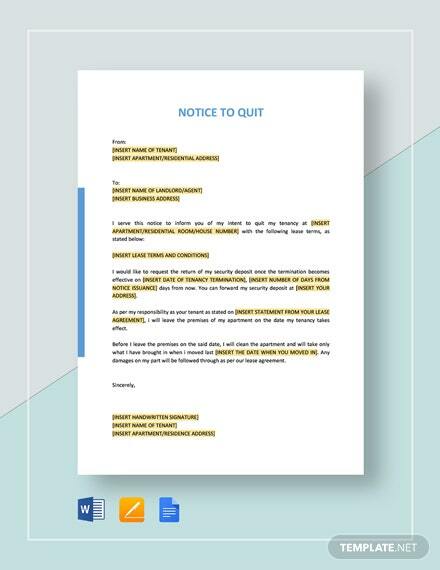 Looking for some samples of notice to quit templates? You’re on the right page. 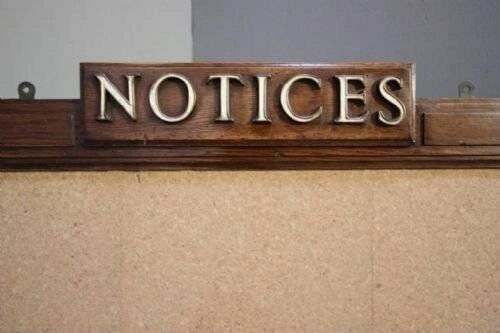 We all know that not all of us can cope up with the technicalities of a notice. To escape from the hassles of drafting one, you can avail from our list. 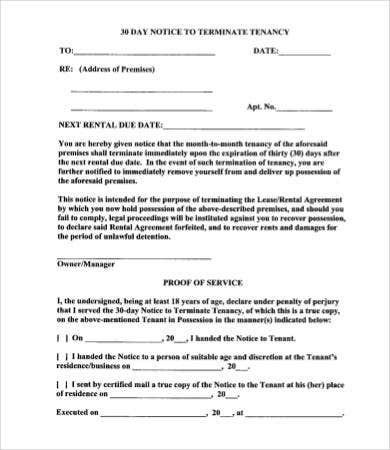 These templates are used by landlords as a termination notice to a specified agreement with his or her tenant. They are of high quality and definition. They are also well researched and credible. There is no room for worries because our downloadable Notice Template samples will help you with your transactions. 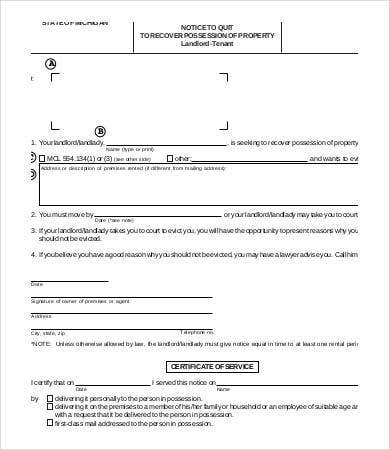 As a landlord, there are various documents provided by law in order to protect and safeguard his or her relationship with his or her respective tenants. By definition, a notice to quit is sent by the landlord to the tenant to quit the premises leased and to give possession of the same to him on the agreed stipulated time. Habitual nonpayment of rent. 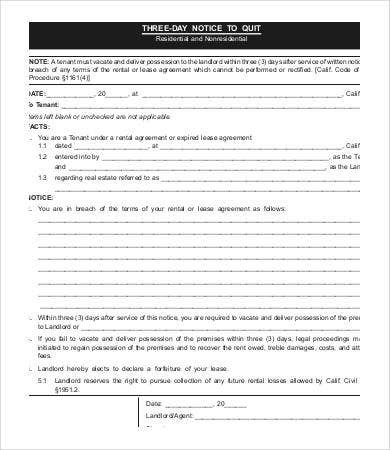 Usually, the relationship between the tenant and the landlord is guided by a contractual agreement. They can freely stipulate anything in their contract provided that it is consensual and not contrary to law. They can insert a stipulation that nonpayment of rent specifically for 3 consecutive times can be a valid ground for the termination of the contract. Damage to property. In this case, the tenant may have done something that caused major damage on the property of the landlord. 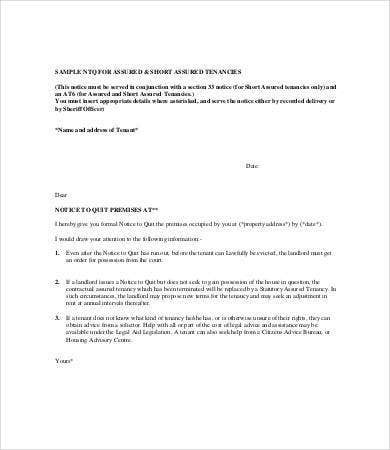 The landlord, who has the legal title of dominion over the property, can always exercise his right to terminate the agreement provided that notice of quit is given to the tenant. Any other just causes that the landlord may deem necessary. This is an all-encompassing reason. As long as the landlord can give a lawful and valid justification for the issuance of the notice to quit particularly those referring to the breaches committed by the tenant, the notice to quit is valid. These are just some of the templates that you can choose from the list. Basically, a notice to quit is relevant not just for the landowner but also for the tenant. The notice will serve as a demand from the landowner to get possession back of his or her property. On the one hand, the tenant is given a reasonable time to comply with the demand. Indeed, such notice will prevent arbitrary evictions and abuses from either party. A notice to quit is a simple, direct, and straightforward document. 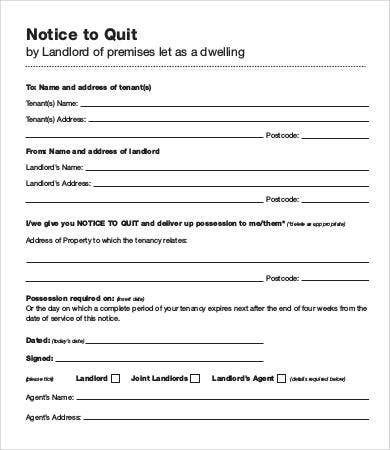 In the service of a notice to quit, make sure to spell out and include the real party in interest or the correct name of the tenant. 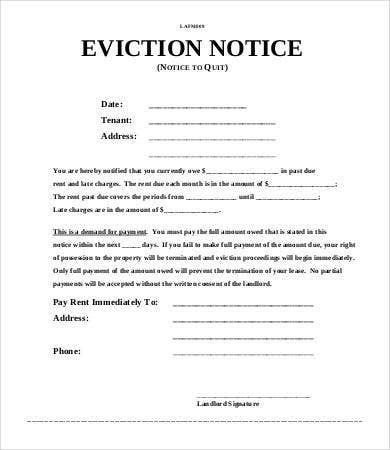 This is to ensure that the tenant will receive such notice. Every country has their own rule of law when it comes to notice to quit. They may have cited some valid and legal grounds from the happening of the same. What’s the relevance of citing a legal ground? 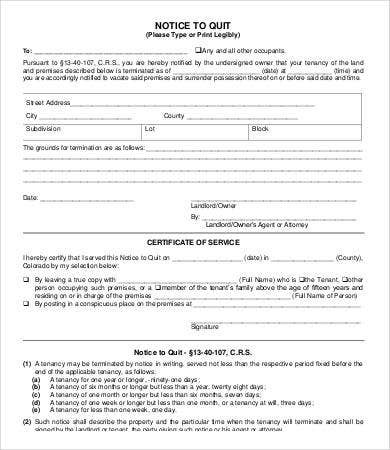 It would be the basis in checking if the notice to quit form was given in due course. These are just some of the salient features of a notice to quit. There are still many factors to consider depending on the contracting parties. Hence, the decision is yours to make and feel free to download our templates. 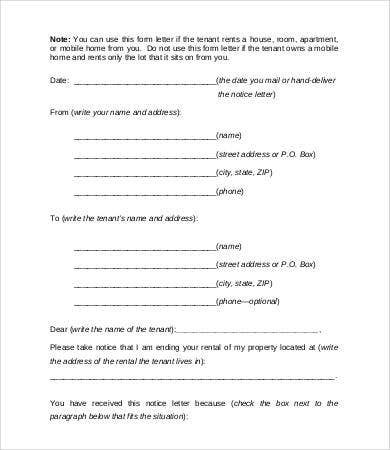 You can also check out our Tenancy Notice Templates.